I have been backpacking since 2000, hold a New York State Guide License and am also a "lean-to adopter" for the Adirondack Mountain Club. 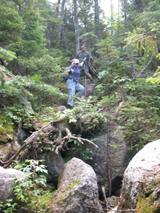 I have completed several long distance thru-hikes including the Northville-Placid Trail, New York; Long Trail, Vermont; and the Cohos Trail, New Hampshire. Our ZipAway!™ Stuff Sacks feature an innovative dual-use design. 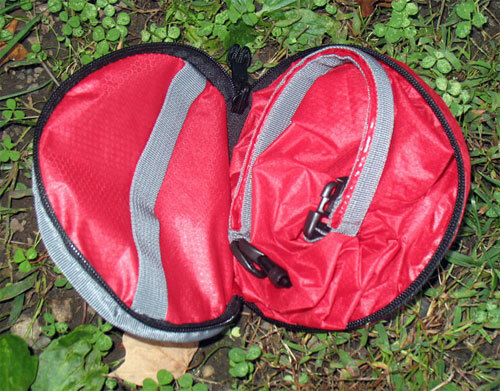 When the stuff sack is fully open, a convenient zippered bottom storage pocket is formed. When the bag is packed away, the storage pocket simply reverses direction to encapsulate the bag, making it an easy-to-pack, easy-to-store disk with a convenient loop handle. The Hydra Light Zip Away Dry Stuff Sack arrived from the manufacturer on an attractive cardboard backing. The packaging gave the size of the sack, the benefits and examples of other Zip Away products. The packaging lists a one year guarantee for workmanship and materials. The sack is made in China. My first impression on the sack is that it is nicely made and attractive. My sample is a deep red with black lettering and trim. The top where the sack is folded over is trimmed in grey and has a black buckle. The zip away compartment has a grey webbed handle on the inside and outside. The material is thick and is coated on the interior. "Super tough 70d rip stop fabric." The Zip Away feature is easy to use. 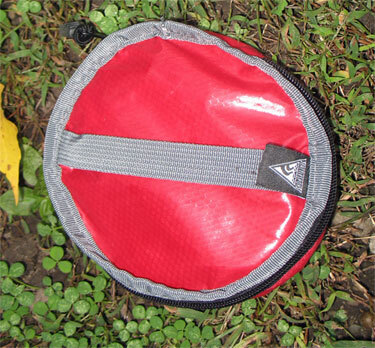 When the sack is tucked into the zipped compartment it is small and is easily stuffed into a backpack. The zipper has a string pull with a rubber end for grasping which should make it easier to open if I am wearing gloves or if my hands are wet. Once opened, the sack easily pulls out and the compartment that once held the sack reverses and the zippered compartment becomes extra storage area for little items. It does not appear that the zipper is water tight. The seams are taped and appear watertight. I opened the compartment and stuffed the sack with some clothing items. I then initially tested how waterproof the sack is. I ran it under running water for about 1 minute and touched the outside of the sack while under water to see if the oils from my hands would effect the waterproof fabric. After 1 minute, I dried the outside off with a towel. It easily dried off. I then opened the sack and pulled out the clothing.The clothing stayed nice and dry! The water did not penetrate the interior. I then inspected the bottom zippered compartment. Water did seep through the zipper. This is not a watertight area. I liked how easy it was to close the sack with my items in it. Like any dry-sack it has a stiff hem at the top that folds over several times and then the buckle closes. This effectively keeps water from going into the interior of the sack when it is closed. Living in northeast New York we have plenty of rain and snow in the mountains. I have slowly been trading up to stuff sacks that are lightweight, durable and yet resistant to moisture. I am looking for that "perfect" stuff sack. When hiking, it is critical to keep some emergency clothing and supplies dry. During August, I was shivering in wet clothes and had to change into my emergency clothing to combat hypothermia during a wet, cold and miserable climb of several High Peaks in the Adirondacks. August in New York State doesn't mean warm weather. Dry clothing is a must. I will be using the Hydralight Zip Away Dry Stuff Sack on a multi-day hike the second week in October while climbing the High Peaks of the Adirondack Mountains in Upstate New York. I also plan on completing my first true winter hike. I will also use the stuff sack when I go downhill skiing to put my extra clothes in so they won't get wet by my boots and outside clothing. During the testing period I will be looking at the following features and how well they work. Is the bag easy to use? What kinds of items will fit in the zippered bottom storage pocket? How big is the pocket and do I find it useful? Is the loop handle securely attached? Does the zipper work smoothly and consistently? Will the material of the bag get caught in the zipper? If it does, how does it affect the material? Does it rip or tear it? How will the stuff sack protect my gear from dampness, the occasional water bladder leak in my backpack and melting snow? What happens if it gets rained on? Will it leak and get my gear wet? Does the sack compress easily when in use? How hard is it to get the extra air out of a full bag when closing it? Is it easy rolled closed? Does the buckle work consistently and easily? Does it "snap" my fingers? Will it break with repeated use? How easy does the Hydralight Zip Away Dry Stuff Sack actually zip away? Is it bulky when put away in its self zip pocket? Can I cram it into my backpack or daypack when not in use or will it take up too much space. Are the materials sturdy or flimsy? Will the material easily abrade or tear? Will the zipper last with many uses? How sturdy is the buckle? 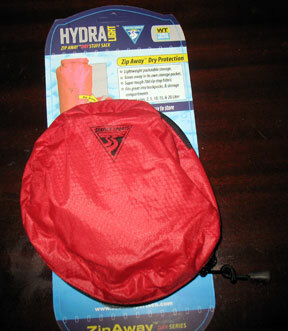 From my initial review of the Hydra Light Zip Away Dry Stuff Sack I like it. It feels well constructed and sturdy. I look forward to testing the sack on my hiking and skiing adventures. Please check back for my long term report. Thank you to Seattle Sports Co. and BGT for allowing me the opportunity to test this item! 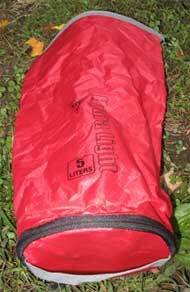 During the Fall of 2008 I was able to give the Hydralight Zip Away Dry Stuff Sack a good test in a variety of conditions in the Adirondack Mountains. In September I spent several days hiking the Adirondack High Peaks and then from October 11 - 17, 2008 I spent the week once again hiking the High Peaks of the Adirondacks completing 11 out of 46 peaks in the region. The terrain is mixed with moderate inclines leading to the peaks where they become challenging. 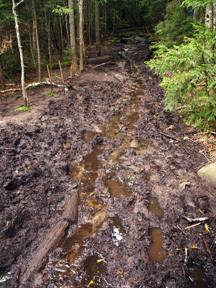 The trails were often extreamly muddy and many of the trails were actually stream beds that were full of large boulders. The weather was seasonable with temperatures in the range of 40F (4 C) to 60F (15 C). We had both sunshine and rain, sometimes in the same day. During each outing I used the Hydra Light Zip Away Dry Stuff Sack to protect the important items in my pack like my spare clothing and first aid kit. The bag is easy to use and the zippered bottom storage pocket is roomy enough for items I like to have handy such as lip balm or a granola bar. I also put some matches and other safety items in it. I found the storage pocket very useful. I further protected my items in the storage pocket by using zip lock bags since the zipper does not hold out water. The main compartment is very water resistant. On a few occassions I was caught in the rain and my day pack became wet or damp inside. I also had a water bladder hose leak inside my backpack and the outside of the Zip Away Dry Stuff Sack was wet. However, the all important dry clothes and emergency supplies stayed completely dry. That is what I call a successful field test! The construction of the sack is very well made. The loop handle has stayed securely attached after using it to tug the stuff sack out of my backpack. The zipper also continues to work smoothly and consistently without having the bag getting snagged in the zipper. The sack compresses easily when in use. I did have to compress it several times to get the extra air out of the bag when it was full of my gear but I did not find this hard to do and I easily rolled the opening closed and buckled it. I did not have any problems with the buckle. It worked just fine and it did not "snap" my fingers. I repeatedly opened and closed the sack with normal use and the buckle works as good as it did when I first tried it. When I wasn't using the sack for my gear I tried using the self zip pocket to store the sack. It was easy to use and the entire sack was easily stuffed into my backpack and daypack. The material is like brand new after using for over 2 weeks total. The color is still vivid and the material is not abraded in any areas. The zipper and buckle work great. I have had no problem with the reliability of the sack keeping my items dry. I am impressed with the overall reliability and durability of this product. The sack is constructed well and keeps my important items dry. I like the zip compartment for incidentals I need to get to quickly. Since this area is not waterproof because of the zipper, I will continue to use zip lock baggies to keep my stuff dry. I was also very happy that the main compartment of the stuff sack successfully kept my gear dry. After a cold fall day hike, it was a treat to put on my warm fleece I had safely tucked into the sack. 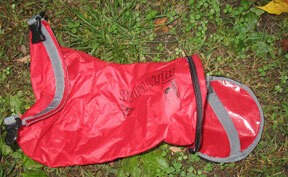 I will continue to test the Hydralight Zip Away Dry Stuff sack in several ways. I will be snowshoeing in the Adirondacks. These will be day trips with a day pack. I will also be using the stuff sack when I go downhill skiing in Vermont and New York. I look forward to testing this further during winter conditions to see if the waterproof material will stay reliable. I'll have my final report in February 2009. During the winter I mainly used the stuff sack in daily use to protect clothing and small personal items in my gym bag and in my day backpack. The weather has been very cold in January with only 5 days above the freezing mark. There have been numerous snow storms and ice storms. There is a thick layer of ice over the snow making it very crunchy to walk on. I have stayed in the areas surrounding my home due to the frigid temperatures. These areas are fairly flat with rolling hills. I am still very satisfied with the performance of this stuff sack. With messy wet boots and shoes, the stuff sack has protected my clothing and other personal items from becoming wet and muddy when the items were stashed together in my pack or gym bag. The bag looks very good too. The color has not faded and when mud got on the outside, I was easily able to wipe it away. The zipper continues to function very well even when I got a plastic baggie stuck in the zipper when I was in a hurry and zipped it up accidentally. I was able to pull the baggie out with no damage to the zipper. After numerous times folding and unfolding the sack it still appears to be very water resistant. I like the Hydralight Zip Away Dry Stuff Sack and will most likely buy another one in a larger size for a multi-day backpack trip planned for this summer. I am impressed with the durability and the water resistance of the sack. I really like the color of the red too. It made it easy to find the bag in my backpack. The zippered section was handy for the little items I needed on a regular basis or for some simple first aid or rescue supplies. I did have to put those small items in a zip-lock baggie since the zipper is not waterproof/resistant and liquid can seep through the zipper and into the little storage area. It was also easy to stow the sack when put away in its own handy zippered compartment. I also like the size of the 5 liter bag. It is big enough to put extra clothing in it for emergencies or when I got cold. Yet, not too big that I could over stuff it with extra items I really don't need to carry. The minimal weight of the actual stuff sack is also a plus. I expect to continue using the Hydralight primarily when backpacking during the spring, summer and fall. I will continue to use it throughout the winter when I'm skiing or snowshoeing. I would recommend this item to my friends. Pro: Light weight, durable, water resistant, easy to use, easily stowed. Con: Zipper pocket does not keep out water. Thank you BGT and Seattle Sports for allowing me the opportunity to test this great item.